Most of us would be familiar with the 16×2 Dot matrix LCD display that is used in most of the projects to display some information to the user. But these LCD displays have a lot of limitation in what they can do. 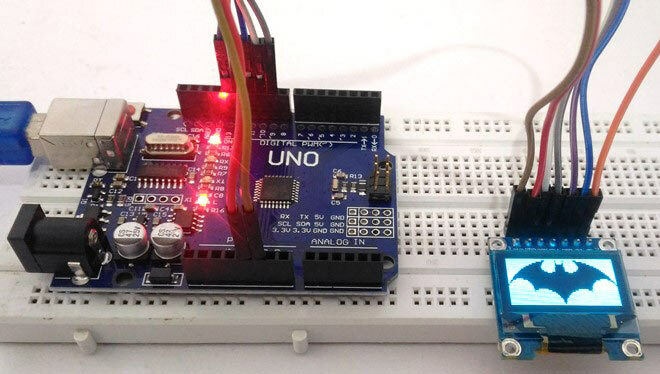 In this tutorial we are going to learn about OLED displays and how to use them Arduino. There are lots of types of OLED displays available in the market and there are lots of ways to get them working. In this tutorial we will discuss about its classifications and also which will be best suited for your project. The term OLED stands for “Organic Light emitting diode” it uses the same technology that is used in most of our televisions but has fewer pixels compared to them. It is real fun to have these cool looking display modules to be interfaced with the Arduino since it will make our projects look cool. We have covered a full Article on OLED displays and its types here. We are using a Monochrome 7-pin SSD1306 0.96” OLED display. The reason for choosing this display is that it can work on three different communications Protocols such as the SPI 3 Wire mode, SPI four wire mode and IIC mode. This tutorial will cover how to use the module in SPI 4-wire mode as it is the fastest mode of communication and the default one. The pins and its functions are explained in the table below. In this tutorial we will simply operate the module in 4-Wire SPI mode, we will leave the rest for some other tutorial. Arduino community has already given us a lot of Libraries which can be directly used to make this a lot simpler. I tried out a few libraries and found that the Adafruit_SSD1306 Library was very easy to use and had a handful of graphical options hence we will use the same in this tutorial. But, if your project has a memory/speed constraint try using the U8g Library as it works faster and occupies less program memory. Note: You will not be able to visualize any backlight/glow on the OLED module just by powering it. You have to program it correctly to notice any changes on the OLED display. Once the connections are ready you can start programming the Arduino. As said earlier we will be using the Adafruit library and GFX library for working with this OLED module. Follow the steps to test run your OLED display. Sketch->Include Library -> Add Zip library as shown below. Then select the library we just downloaded. You can select only one library at a time, hence you have to repeat this step again. Step 3: Launch the example Program by selecting File->Examples->Adafruit SSD1306 -> SSD1306_128*64_SPI.ino as shown in the image below. Step 4: Inside the example program on top of line 64 add the line “#define SSD1306_LCDHEIGHT 64” as shown in the image below. Step 5: Now upload the program and you should see the OLED display firing up with the default Adafruit example code as shown in the below picture. The full working video is given at the end. To display the content inside a variable the following code can be used. As you can see, in order to display an image the bitmap data must be stored in the program memory in form of PROMGMEM directive. Simply put, we have to instruct the OLED display what to do with each pixel by passing it a sequence or values from a n array as shown above. This array will contain the bitmap data of the image. It might sound complicated but with the help of a web tool it is very much easy to convert an image into a bit map values and load them into the above array. Simply load the image and adjust the settings to get your preferred preview of the image. Then click “Generate Code” copy the code and paste it into your Array. Upload the program and you are all done. I tried displaying a batman logo and this is how it turned out. There are still a lot of things that you can do with these libraries. To know the complete possibilities visit the Adafruit GFX graphics Primitives page. Hope you got this running and ready to implement an OLED display in some of your projects. If you had any problem share them in the comment section and I will try my best to rectify them. // Show the display buffer on the hardware. // to make them visible on the display hardware! As I have gone through the example which you gave in your blog and it found really helpful to me. but I am using SSD1331 OLED display and its work on SPI Protocol. Some of the function may be not supported to SSD1331 OLED. Please give me a suggestion which modification needed? Sorry patik, I haven't tried a SDD1331 OLED module yet. So can help you with this for now. But I sure the basics will remain the same. Sir, how to read data from OLED for eg if I display eagle using keypad on OLED then how I can read that data from OLED?? My question is, will it work?